The phrase –The Middle of Nowhere- is thrown about with consummate ease. To some people New Jersey is the middle of nowhere, while to others it is the middle of the Gobi desert. To me, it’s where there are no people around, or on a straight open road. Before heading up the AlCan, for me, the 10 freeway through West Texas was the middle of nowhere. Or the 5 through Central California, or the 80 cutting straight through the waving cornfields of Nebraska. But none of those really compare to the AlCan. On the 10 or the 5 or the 80 there are signs of life, there’s a road, or a gas station or a general store at least every twenty miles, more probably every five miles. 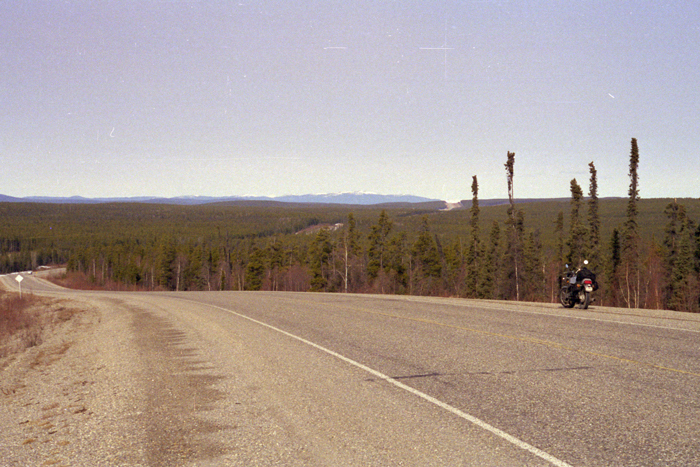 But on the AlCan, when I was way up north, when the road vaguely follows the invisible barrier between British Columbia and the Yukon, there were times when I went 60 miles without seeing a gas station, and some of those were closed. There were moments when the motorcycle felt like it was on a treadmill. A beautifully convincing treadmill, but a treadmill nonetheless. While the roads in the southwest of the United States tend to be straight lines. They travel over perfectly flat land for hundreds of miles. The road on the AlCan was never like this. It was constantly shifting and always the same. The simple blacktop of the AlCan was two lanes wide, enough space for one car in either direction. The trees by the side of the road had been chopped back thirty feet, so there was a stripe of blank earth leading up ahead. Oh, there were rivers, and valleys, and mountains, but all I remember is the soft rolling hills. The motorcycle and I would rise over a soft rounded hill, to see a shallow valley up ahead, beyond that was another soft easy hill, and beyond that hill and another hill. Those hills, with the road scar cut across the top, went on for miles and miles and miles. The air was so clear, I could see the mountains in the distance, but because of the clear air, they never seemed to get any closer, just sat on the horizon, a mirage that I was never going to reach. This flat tundra was shaped thousands of years ago. Glaciers moved down during the last ice age and chopped the land flat like a knife smoothing icing. During the summer it is marshland, filled with the Alaskan state bird, sucking moose dry. But during the winter, it is frozen solid. The wind from the artic flows south and east across this flatland, collecting speed and power and aching cold as it moves. That is why the winters in Chicago, Buffalo and New York can be so horrible. And why Mount Washington in New Hampshire has some of the strongest winds in the world. Anchorage, on the other hand is surprising pleasant. It sits next to a body of water, and is relatively shielded by mountains. Not that it isn’t cold; there is snow on the ground from mid-October to mid-April. But the temperature does not fluctuate wildly. During the winter it seemed to float between 10 and 20 degrees F. During the summer it sits at a pleasant 60. I remember listening to the complaints of the locals, when the temperature had the unmerited horror to reach all the way to 85. The road was deserted. It thought, at first, that the road was like this all the time. But because of the upcoming weather, and the number of RV’s I saw traveling through Anchorage later in the summer, I realized that I was just a few weeks early. The twin exhaust note of my three cylinder was the only sound I heard. I had no stereo, no Walkman, and the ipod was still just a gleam in Steve Jobs’ eye. So my mind emptied. Maybe that is why I love traveling so much, that I was able to sit on the bike, hold onto the throttle and look out over the countryside and just watch. It is the ultimate head clearing experience for me. My mind does not go into the 3 am downward spiral. When I lay there staring at the ceiling, revisiting all the stupid things I have done in my life. Reliving the horrible moments, and the missed opportunities. On the road, going forward, there is none of that self-doubt. None of that questioning, it is just the road and you, moving forward. I guess it could be called Zen. The art of being at peace with you and the world. I don’t know, I’ve never studied Zen any more than from that book about motorcycle maintenance. But I know that it feel right, that it feels good. And sometimes with that head clearing, the way forward in life looks a little less confusing. The Alaskan-Canadian Highway, or the AlCan, was built by the U.S. Army Corps of Engineers in the summer of 1942. Yes, the whole 1500 miles was built in one summer. The government was afraid Japan would attack and cut off the shipping routes from the Lower 48 to Alaska. I quickly found that most Alaskans refer to the rest of the United States as ‘The Lower 48’. I would say, “I’m going to California for a week.” And they would answer with “Oh, you’re going to the lower 48.” The only exception to this was Hawaii, which every Alaskan referred to by name, and I think every Alaskan visited in the month of February. When the road was first built, through this desolate marshland, it was mostly dirt tracks, and wooden or pontoon bridges. But now it has been finished by the Canadian Government and is a smooth black top – modern bridged highway. The official highway runs from Dawson’s Creek in Canada, to Delta Junction, near Fairbanks, Alaska. It seems only natural to ride the whole road, from beginning to end, but once I entered Alaska, I was to cut off the road and head south to Anchorage. I felt somewhat guilty about not finishing the complete highway. But I think I did enough miles on my motorcycle for a little while. Total mileage from Laguna Beach to Anchorage was just about 4000 miles. That’s 1000 miles more than from New York to Los Angeles. 400 miles seemed like a good round number, so did 10 days, so I rode 400 miles each day, basking in the glory that is a hot shower in a motel room each night. It eventually took me 11 days, but it was not my fault, it was the fault of a prophetic gas station attendant, and some flaky water.